.. yeah , you heard it right . .. even the I.R.S. suffers a security breach ..
.. some folks finances get to be pretty sophisticated , such as [now] Bill and Hillary Clinton . With the news info coming out about the Clinton ‘s antics about their fiannces , they likely employ quite a few tax professionals in order to get their taxes done properly ..
.. Which makes this blunder all the more stupid ! ..
.. conventional arms and ballistic missiles are not ” throw – ins , ” you damn idiot ! ..
.. Iran is doing very well in developing munitions and missiles on its own , thank you very much . Then you idiots decide to add these items as a so – called ” throw – in ” to the Iran nukes deal ? How stupid can you get ! ..
.. the Iranians keep running their mouths off . .. even these days , even for public consumption ..
.. you think that it would give the ObamaCraps some moments of pause in dealing with the Mullahs in Qum . Unfortunately , it does not ..
.. you have to be kidding ?? ..
.. unfortunately , I am not kidding ..
.. Bolivia is one of South America ‘s poorest nations . It easily has the continent ‘s lowest per – capita GDP , even lower than that of Suriname and Venezuela . So there is not a whole lot there to wreck as it is . 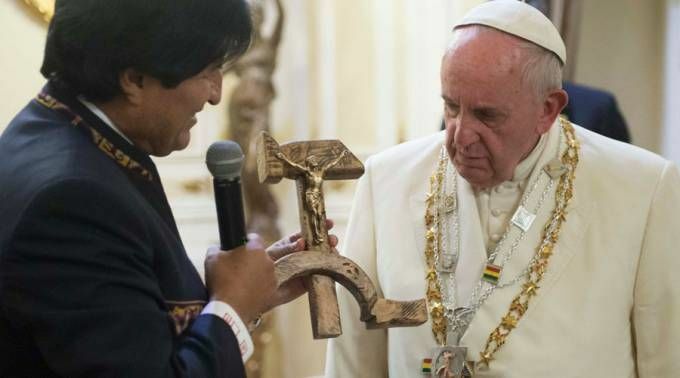 But morales is trying ..
.. [link] to the blog post // video clips ..
.. of all things , a ” Communist Crucifix … ” [see below] ..
.. so , how did the Holy Father react ?? .. the ObamaCraps are excusing almost everything that the Mullahs do and lie about . They seem to want a deal that bad .. It seems as if the Obama Administration has “switched sides,” playing the role of Iran’s attorney and explaining away their violations, rather than protecting the country by guaranteeing that Iran follow the JPOA. As the AP article about the IAEA report reminds readers, it is in the administration’s best interests to ignore or spin away any violations. Even more serious than the administration saying the Iranians cheated but it doesn’t count, is that they are also saying that Iran complied with the JPOA— a legal statement – even though Iran didn’t. It’s the administration that invented the compliance. When the administration officials go to the Hill to explain the “science” behind the one-year breakout timeline (which they insist they can achieve, despite giving into Iran’s demand to spin thousands of centrifuges because Iran will convert any overages into yellowcake) they will be misstating the truth (lying). The evidence suggests that the Iranians can’t or won’t implement those requirements. Some may say reports of Iranian violations are just a “neocon” effort to question the administration’s policy of sitting down with Iran, or that they should agree to separating the issues of Iranian state sponsorship of terrorism and holding of American prisoners from the talks. Nonsense. Even those who support the talks must realize that what we are seeing here is that the president is so desperate for a deal that he will wish away Iranian malfeasance and risk a nuclear conflagration that has the potential to kill millions here in the United States and throughout the world . .. Woodward and Berrnstein , themselves . .. I certain am . .. but , at what price ..
.. you can thank a ” smoking gun ” e – mail for that ..
.. the White House has been lying to us all along . Not only that , they lied , and redacted the e – mail from Congress . Yea , you heard that right . Congress was supposed to get this one . You bet that they wanted to see it . But noooooo! ..
.. or , the Socialist Security Administration steals an older woman ‘ s tax refund … Why ? … there is an old debt from an overpayment to the woman ‘ s father . The debt goes back to the winter of 1977 . Yes , 37 years ago …. .. the woman ‘ s father is now deceased . Also , the S.S.A. does not have adequated documentation of the debt . So , what happens ? They find the nearest next-of-kin (the woman) and take her tax refund away from her … in other words , they swipe it . They steal it …. .. yea , I am talking about a Bigot Worst Class ..
.. his lame name is Al Sharpton ..
.. IRSgate is bigger than Watergate . .. when those groups applied for tax – exempt status , their information goes into a ” file . ” All of it . It is for official use only . Only for the judgement of whether the group deserves their non – profit tax status , or not . Just that . Nothing else . .. it is abundantly clear that those files were used for non – official purposes [felony] . Most likely , several people connived together to put this act to together [conspiracy] . Other people have used IRS and other government assets to keep others from finding out official information [obstruction of justice , lying to congress , lying to federal agents , misconduct in office] ..
.. we should expect more from the Infernal Revenue Service . It should be non – professional , and most certainly , non – political . People ‘ s most highly personal and financial information is on those tax returns . They deserve a fair judgement from professionals acting in a professional manner . They do not deserve people playing around with that stuff . .. these groups have had their civil rights violated . Very much so . If things break the way that I believe , Chuck Grassely will be the new chairman of the Finance Committee in the Senate next year , once the GOP gets the majority . God in Heaven help the Service if they have been screwing around , and Grassely has caught them in the act . Chuck will dig and dig to find out the truth . He will have the aid of Dave Camp (House Ways & Means Chairman) to aid in the digging . .. Obama is in Fantasyland . His debates are with fellow faculty . He is acting as if the world is the way that he wants it to be , not the way it really is . Also , the Washington ComPost is right . .. [link] to the blogpost..
.. John Boehner should and must put a stop to this , immediately . .. [link] to the investigative videos ..
.. you heard me . .. you dummies got caught in the act . .. your ” reset ” begat weakness . Putin sees that . He took advantage of that ..